Imprisoned Christian convert Maryam (Nasim) Naghash Zargaran, who had no access to legal counsel during her trial in 2013, was hospitalized in Tehran on the third day of her hunger strike on May 29, 2016, but was returned to prison without treatment that same day. Political prisoners in Iran are singled out for harsh treatment, which often includes denial of proper medical care. Zargaran’s requests for furlough (temporary leave) have been repeatedly rejected by the judicial authorities, the source told the Campaign. Prisoners who have been sentenced to less than 10 years imprisonment qualify for early conditional release after serving a third of their sentence, but so far this condition has not been applied to Zargaran’s case, the source added. 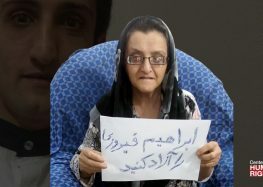 Despite her hunger strike and her ailing health, the authorities have so far refused to respond to Zargaran’s requests. Zargaran, 38, was a children’s music teacher who was arrested on November 5, 2012 for converting to Christianity. She was initially held for five days in the Vozara Detention Center in Tehran under unsanitary conditions along with ordinary criminals, including drug addicts. She was then transferred to Evin Prison and released several days later on bail. Despite having no access to legal counsel, Zargaran was sentenced to four years in prison by Branch 28 of the Revolutionary Court by Judge Mohammad Moghisseh for “assembly and collusion against national security” in 2013. The sentence was later upheld by the Appeals Court, and she began serving her sentence on July 15, 2013 in Evin Prison.